If you live in Phuket then you can contact the Phuket office of Thai immigration. We have listed their contact details below with their telephone number and address. Note that this office does not have the ability to change visas. That is they cannot change a tourist visa so you can apply for a work permit. That has to be done at the Head Office in Bangkok. If you are living in Phuket and need a visa extension or the needed assistance for a retirement visa, marriage visa or business and work permit then contact our offices in Phuket for more assistance. 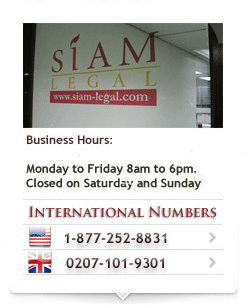 Siam Legal in Phuket has been there for more than 7 years. Call us today or speak to us online for more assistance. Our offices in Phuket has excellent relations with the Thai Immigration department and will be able to assist you in criminal matters and visa overstay issues. I am currently in Thailand(Phuket) with a visa of B-Non immigrant Visa for double entry for an internship. Actually, the visa for the first 3 months are about to expire by the 6th of September 2015. (Date of entry : 09.06.15)I would like to know how should I proceed to renew it so that I can complete my internship.Please note that I also have the work permit. The same institution who has provided you with the documents when you first applied for your Non immigrant B visa will be the one to assist you if you wish to apply for the same type of visa. Therefore, we advise that you coordinate with your company or institution to help you with your concern. You will need to apply for the visa extension either at the immigration office in Thailand or at the Thai Embassy in your home country (or also in a neighboring country of Thailand). It is best that you coordinate with your Thai company or employer on this matter as the requirements for the visa extension will be provided by them. Want to get answers to the following questions? I have arrived and have holiday in Patong Beach. I’m from Norway and has a visa of 60 days, which runs out 08.desember 2015. Can I come to your office in Phuket at 08.desember 2015, to get an extension of 30 days in my passport? What do I need of documents to get visa extended by 30 days? Hi, I’m in thailand for 6 months on a ED visa, after three months I will have to get a visa extension for the rest of my stay here, I have been asked to produce a registration of residents of where I am staying in phuket patong, however the place I am staying will not give me the required photo copied document need for the registration, I have already paid them fr my whole time stay here and they won’t register me to the Immagration office, what can I do to resolve this? I don’t want to have to leave thailand after just three months cause I still have school until the 29th of march and i will be losing all the money I gave the hotel to rent there until then, please help? It is best that you check with your school on how they can help you with your situation. You might want to check with them also if a border run trip is an option for you to get an extension to your ED visa. I was just inquiring as to whether I am able to obtain a 30 day visa extension from my 30 day exemption visa that I received on arrival as an Australian citizen at your Immigration office? If this is possible, is 30 days the maximum length of time for an extension on this type of visa? You may visit any immigration offices in Thailand to apply for a 30 days extension to your stay. This is the maximum duration that you can extend your visa. I am coming to phuket next week and had planned to fly to bangkok for visa extension however have seen you can also extend australian tourist visa in patong and phuket town. Does it matter which you go to and are both still operating? Visa extension for tourist visas can be obtained from any immigration offices in Thailand and therefore, you can apply for the extension from either of the two provinces. You will need to visit the immigration office in Phuket and notify them about your change of address. This is supposed to be done immediately after you have moved to the new address prior to the scheduled date of the 90-day reporting. I am a NewZealand citizen and my partner has an Irish passport with NewZealand residence visa. We came to Thailand on a tourist visa on 19/12/2015 and flying back to NZ on 19/01/16. On our passports we have got Thai visa stamp until 17/01/2016. We are staying in Thailand for 32 days. Do we need to get a visa for 2 extra days? If yes, can you please advise what documentations we require to provide. You are able to extend this tourist visa stamp for another 7 or 30 days at the local immigration office. For the extension, you just have to submit one passport size photo (4cm x 6cm) with white background and pay the fee of 1,900 Thai baht. Im german and Im going to Thailand as a tourist with one way ticket, my plan is to go to laos after or cambodia by bus and travel more around but I don’t have the date yet and I don’t have a return ticket to Germany yet as well because I don’t know when I will go back, its ok to go in this conditions? As long as you can prove to the immigration that you are going to leave Thailand on or before your permitted stay is over, then you should be able to enter the country. If you are unable to provide return tickets, perhaps you can show them other travel itineraries. I’m Portuguese and traveling with a chilean friend to Thailand from Langkawi and we were informed that we will only get a 15 day visa on arrival. Is there any way we can extend our visa longer than 7 days since we were planning to stay for a month in Thailand? if yes, where? Your option is to apply for a tourist visa if you wish to stay in Thailand for more than 15 days. Please contact or visit the nearest Thai Embassy or Consulate for information about tourist visa application.